PHOENIX, January 17, 2018 — For Immediate Release. The comment period for those with Federal or private land claims tied to the proposed land exchange between the Federal Government and Resolution Copper Mining LLC for a copper mine near Superior, Arizona, closes on January 29, 2018. PHOENIX, December 15, 2017 — For Immediate Release. As evaluations continue for the proposed land exchange between the Federal Government and Resolution Copper Mining LLC for a copper mine near Superior, Arizona, the Forest Service has established a comment period for those with Federal or private land claims. PHOENIX, November 2, 2017 — For Immediate Release. The Forest Service has developed a draft version of a report that documents the agency’s alternative development process for the Resolution Copper project. PHOENIX, March 21, 2017 — For Immediate Release. The Tonto National Forest will host two public workshops – March 21 in Superior, Arizona, and March 22 in Gilbert, Arizona -- to collect information on what the public deems important with regard to mine tailings as the Forest Service analyzes alternate locations for Resolution Copper’s proposed tailings facility. PHOENIX, March 9, 2017 — For Immediate Release. Tonto National Forest officials will conduct two public workshops in March to collect information on what the public deems important with regard to mine tailings as the Forest Service analyzes alternate locations for Resolution Copper’s proposed tailings facility. A document summarizing the scoping process for the Resolution Copper Project and Land Exchange Environmental Impact Statement (EIS) is done and available online at https://www.resolutionmineeis.us/documents/usfs-tonto-scoping-report. PHOENIX, August 25, 2016—For Immediate Release. Forest Supervisor Neil Bosworth has approved both an environmental assessment and a plan of operations allowing Resolution Copper Mining, LLC, to gather necessary data to help evaluate possible construction of a large tailings storage facility on National Forest Lands. PHOENIX, June 20, 2016 — For Immediate Release. The Tonto National Forest Supervisor’s decision to extend the public scoping period for the Resolution Copper Mining project and land exchange gives the public additional time to submit comments. The public now has until July 18, 2016, to submit comments. PHOENIX, May 20, 2016—For Immediate Release. The Tonto National Forest has extended the public scoping period for the proposed Resolution Copper mine and associated land exchange Environmental Impact Statement (EIS). An additional public scoping meeting will be held on June 9, 2016, at the Central Arizona College San Tan Campus, located at 3736 E. Bella Vista Rd, San Tan Valley, Arizona 85143. PHOENIX, March 18, 2016 — For Immediate Release. 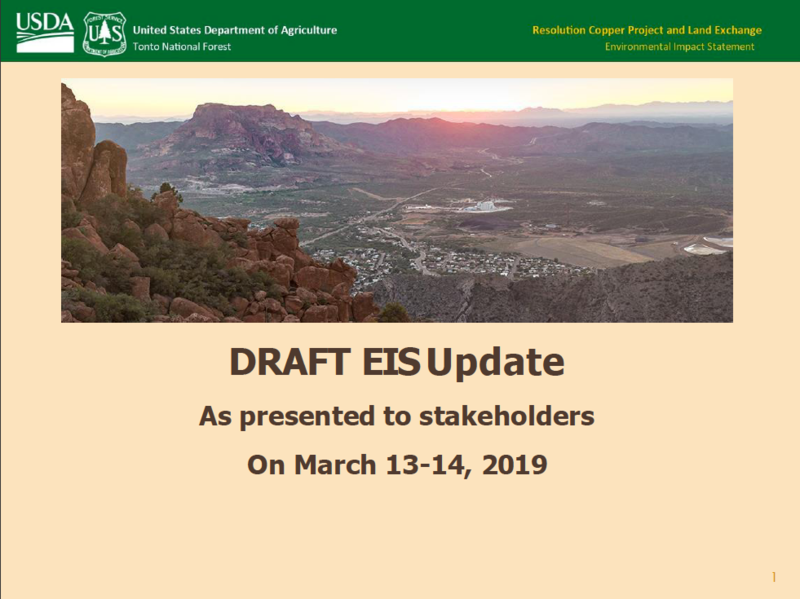 The Tonto National Forest has published a Notice of Intent to prepare an Environmental Impact Statement (EIS) in the Federal Register, announcing the beginning of the EIS process for the proposed Resolution Copper mine and an associated land exchange.